My dad, Darrel Hammon, is quite the inspirational figure. Not only was he my basketball, t-ball, you-name-it-ball coach growing up, he was my essay editor, my math homework checker and an all around fantastic dad. When I was younger he would tell my sister and me Bob the Bullfrog stories every night before bed. Every night would be another adventure, but the one story we begged him to tell us over and over again was one my dad told us one Christmas Eve. Can you believe 20 years later he actually published that very story he told us at bedtime? 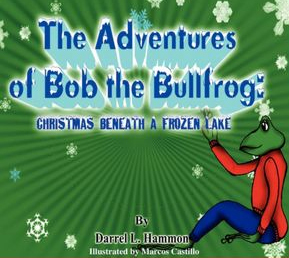 Yes, Christmas Beneath the Lake: From the Adventures of Bob the Bullfrog is now available for purchase on Amazon. My parents are currently serving a mission for the LDS Church in Santo Domingo, Dominican Republic. The illustrations for Christmas Beneath a Frozen Lake were drawn by Marcos Castillo, a native from the Dominican Republic. This is the first book he has had the opportunity to illustrate. How exciting! I couldn't be prouder of my dad and I can't wait for him to pen other Bob the Bullfrog adventures.